For the town in the province of Milan, see Gorgonzola, Milan. 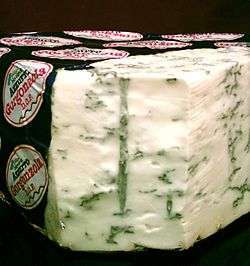 Gorgonzola (/ɡɔːrɡənˈzoʊlə/; Italian pronunciation: [ɡorɡonˈdzɔːla]) is a veined Italian blue cheese, made from unskimmed cow's milk. It can be buttery or firm, crumbly and quite salty, with a "bite" from its blue veining. Today, it is mainly produced in the northern Italian regions of Piedmont and Lombardy. Whole cow's milk is used, to which starter bacteria are added, along with spores of the mold Penicillium glaucum. Penicillium roqueforti, used in Roquefort cheese, may also be used. The whey is then removed during curdling, and the result aged at low temperatures. 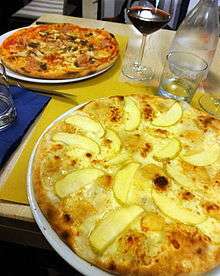 Pizza Trieste with Gorgonzola and apples. During the aging process metal rods are quickly inserted and removed, creating air channels that allow the mold spores to grow into hyphae and cause the cheese's characteristic veining. 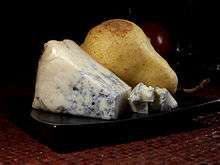 Gorgonzola is typically aged for three to four months. The length of the aging process determines the consistency of the cheese, which gets firmer as it ripens. There are two varieties of Gorgonzola, which differ mainly in their age: Gorgonzola Dolce (also called Sweet Gorgonzola) and Gorgonzola Piccante (also called Gorgonzola Naturale, Gorgonzola Montagna, or Mountain Gorgonzola). Gorgonzola may be eaten in many ways. It may be melted into a risotto in the final stage of cooking, or served alongside polenta. Pasta with gorgonzola is a dish appreciated almost everywhere in Italy by gorgonzola lovers; usually gorgonzola goes on short pasta, such as penne, rigatoni, mezze maniche, or sedani, not with spaghetti or linguine. It is frequently offered as pizza topping and is occasionally added to salads. Combined with other soft cheeses it is an ingredient of pizza ai quattro formaggi (four-cheeses pizza). James Joyce, in his 1922 Ulysses, gives its hero Bloom a lunch of "a glass of Burgundy and a Gorgonzola sandwich". In his 1972 book Ulysses on the Liffey, critic and Joyce scholar Richard Ellmann suggests that "Besides serving as a parable that life breeds corruption, Gorgonzola is probably chosen also because of Dante's adventures with the Gorgon in the Inferno IX. Bloom masters the monster by digesting her." In 2016 a new off-Broadway musical, "Gorgonzola: A Cautionary Sicilian Tale", opened. ↑ Richard Ellmann (1972). Ulysses on the Liffey. Oxford University Press. p. 191. Wikimedia Commons has media related to Gorgonzola (cheese).